The idea of a technology-led solution to climate is gaining ground, most recently with a joint AEI-Brookings proposal. Kristen Sheeran has a nice commentary at RCE on the prospects. Go read it. I’m definitely bearish on the technology-first idea. 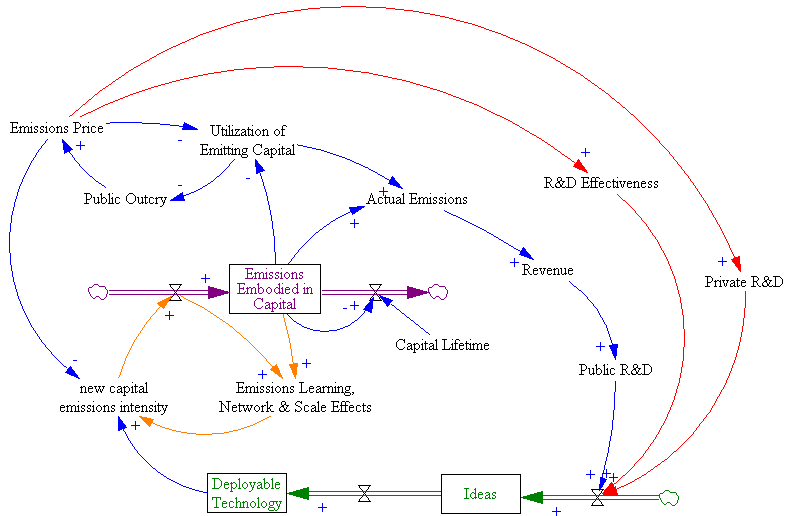 I agree that technology investment is a winner, with or without environmental externalities. 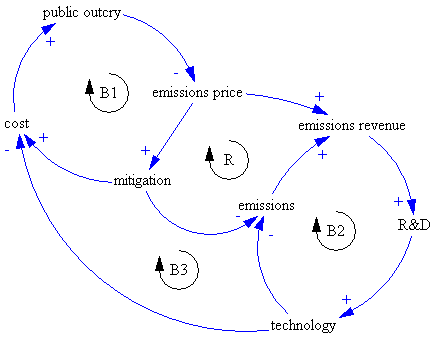 But for high tech to solve the climate problem by itself, absent any emissions pricing, may require technical discontinuities that are less than likely. That makes technology-first the Hail-Mary pass of climate policy: something you do when you’re out of options. The world isn’t out of options in a physical sense; it’s just that the public has convinced itself otherwise. That’s a pity. 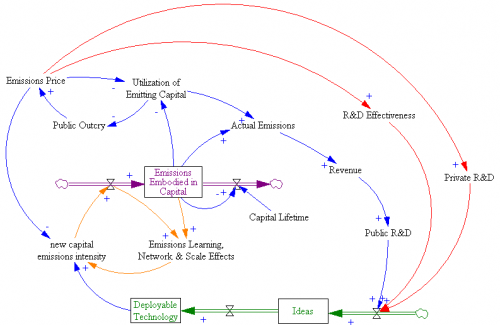 Author TomPosted on October 14, 2010 Categories Climate, Policy, TechnologyTags AEI, Brookings, TechnologyLeave a comment on Technology first? I’m usually quick to point out the limitations of technology for reducing environmental and other problems. But that doesn’t mean it’s not important. Yesterday I took a tour that hilighted how big the opportunities can be when technology and slight lifestyle changes team up. The tour was of CalEPA’s LEED platinum skyscraper – evidently the first of its kind, but now a few years old. Interestingly, it was initially designed as an ordinary building, and design changes were introduced late in the game, which gives hope that most of the same innovations could be implemented as retrofits on older buildings. When you walk up to the building, there’s no indication that there’s anything unusual about it. If anything, it’s massive (salvaged) stone decorative features lead one to think it could easily be an extravagant energy hog. That impression continues on the inside, with elegant and tasteful lighting and finishes. No hairy unwashed treehuggers freezing in the dark here. Yet, the building uses a third the energy (per sq ft) of its peers nearby, even with a big datacenter on one floor that consumes a third of the energy in the 25-story structure. The big heroes are an efficient skin, with low-e windows and detailing to reduce solar gain on the south and west sides, coupled with an advanced HVAC system. Climate control combines 10,000 sensors with three different sizes of chiller unit and variable-speed motor controls. That way, equipment always operates near its optimum load. Soon, a retrofit will use groundwater (which has to be pumped out anyway) to aid cooling. Heating and cooling costs are lower, yet comfort is improved by the advanced controls. The occupants certainly contribute a lot to efficiency. Over 80% use bikes or transit to commute, aided by a beautiful bicycle parking garage in the basement (complete with air compressor and lockers). Most prefer motion-sensitive task lights, so area lighting stays off. They adopted double-side network printers to reduce paper waste, and recycle assiduously. Worm-bin composting is a popular office activity. As a result the building managers have to haul trash only twice a month instead of the typical twice a week. Because staff don’t have to spend as much time with regular garbage, they have more energy to figure out how to recycle used computers and other unusual materials. Sometimes the benefits are unexpected. To reduce nighttime lighting loads, most of the leaning in the building happens during the day. Side effects include greatly reduced reports of theft and workers’ comp claims, better cooperation on cleaning and recycling (aided by the low waste flow), and greater occupant satisfaction. It turns out that it’s easier to like someone you see on a daily basis. Materials have side benefits too. Zero-VOC paints mean that occasional repairs don’t stink up the place and needn’t be confined to weekends. Low-volatile, recyclable carpet tiles turn out to be extremely durable and repairable, and permit creative design. The amazing thing is that most of the features paid for themselves in under two years, with correspondingly huge ROIs. None takes a radical change in workstyle, but there’s lots of synergy among them. It wasn’t easy to pull this off, in the sense that it took a lot of thinking, but if you think thinking is fun, then you wouldn’t call it hard either. An effective climate policy needs prices, technology, institutional rules, and preferences. Here we show that two-thirds or more of all the energy efficiency improvements and decarbonization of energy supply required to stabilize greenhouse gases is already built into the IPCC reference scenarios. 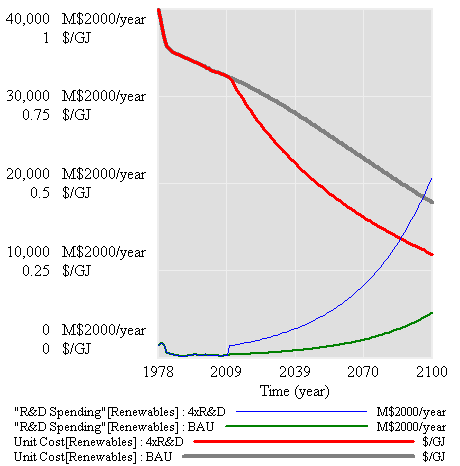 This is because the scenarios assume a certain amount of spontaneous technological change and related decarbonization. Thus, the IPCC implicitly assumes that the bulk of the challenge of reducing future emissions will occur in the absence of climate policies. We believe that these assumptions are optimistic at best and unachievable at worst, potentially seriously underestimating the scale of the technological challenge associated with stabilizing greenhouse-gas concentrations. The IPCC scenarios include a wide range of possibilities for the future evolution of energy and carbon intensities. Many of the scenarios are arguably unrealistic and some are likely to be unachievable. For instance, the IPCC assumptions for decarbonization in the short term (2000’“2010) are already inconsistent with the recent evolution of the global economy (Fig. 2). All scenarios predict decreases in energy intensity, and in most cases carbon intensity, during 2000 to 2010. But in recent years, both global energy intensity and carbon intensity have risen, reversing the trend of previous decades. 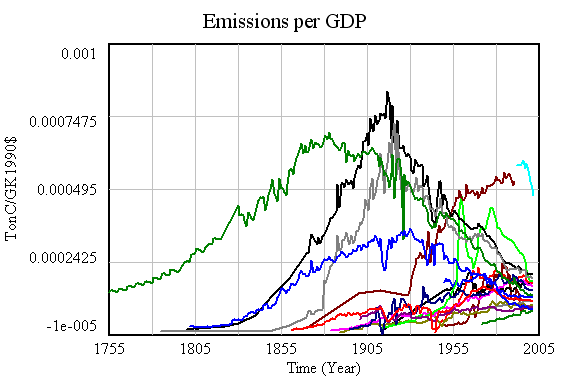 Emissions intensity of GDP for 18 major emitters. Notice the convergence in intensity, with high-intensity nations falling, and low-intensity nations (generally less-developed) rising. 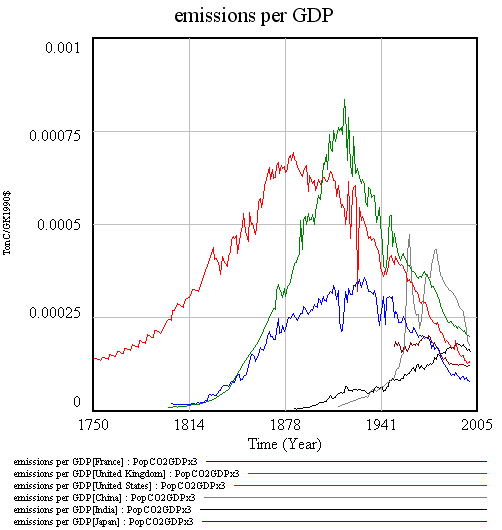 Corresponding decadal trends in emissions intensity. Over the long haul, there’s some indication that emissions are falling faster in developed nations – a reason for hope. But there’s also a lot of diversity, and many nations have positive trends in intensity. More importantly, even with major wars and depressions, no major emitter has achieved the kind of intensity trend (about -7%/yr) needed to achieve 80% emissions reductions by 2050 while sustaining 3%/yr GDP growth. That suggests that achieving aggressive goals may require more than technology, including – gasp – lifestyle changes. 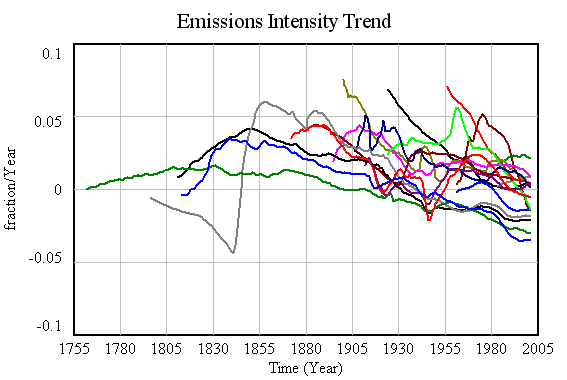 A closer look at intensity for 6 major emitters. Notice intensity rising in China and India until recently, and that Chinese data is indeed suspect. There is no question about whether technological innovation is necessary ’” it is. The question is, to what degree should policy focus directly on motivating such innovation? The IPCC plays a risky game in assuming that spontaneous advances in technological innovation will carry most of the burden of achieving future emissions reductions, rather than focusing on creating the conditions for such innovations to occur. There’s a second risky game afoot, which is assuming that “creating the conditions for such innovations to occur” means investing in R&D, exclusive of other measures. To achieve material reductions in emissions, “occur” must mean “be adopted” not just “be invented.” Absent market signals and institutional changes, it is unlikely that technologies like carbon sequestration will ever be adopted. 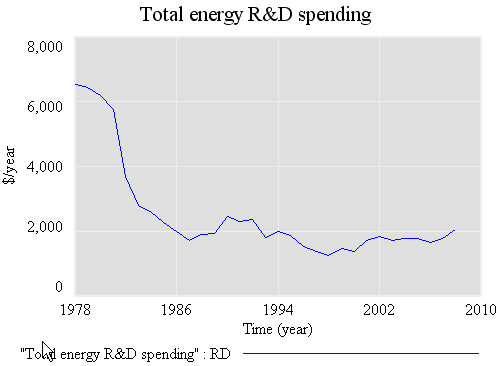 Others, like vehicle and lighting efficiency, could easily see their gains eroded by increased consumption of energy services, which become cheaper as technology improves productivity.